Do you know what to do if you see a dangling skier? There are several things to do to keep them safe while help is on the way. There are also tips to consider to avoid an accident while on a ski lift. Riding a ski lift requires the rider to follow the rules of the resort. To be safe and secure on a ski lift, there are certain precautions to keep in mind. 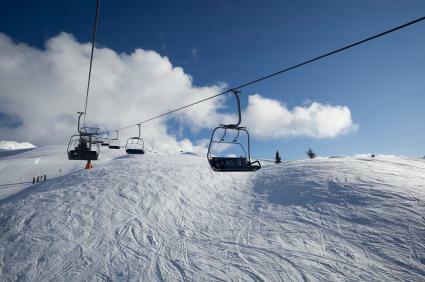 Many chairlifts have safety bars that can be lowered in front of the rider to keep them secure in the seat. If the lift you are riding on has a bar, it is advisable to use this feature. Many accidents occur when not seated properly in the chair. Using the safety bar is also a must for children. Children may not fit properly in the seat as an adult would fit. The bar will keep them secure in the seat. Never get up or bounce in the seat. Make sure you are seated properly during the lift ride. Some ski lifts have footrests. These are also useful in keeping the rider safe. The footrest helps the rider rest their muscles while riding with skis or boards on their feet. Accidents can easily happen when riders are horsing around. Never ski or snowboard while under the influence of drugs or alcohol. Impaired ability is not only dangerous on the slopes but is dangerous on the lifts as well. Keep safety a priority while riding the lift. Another way to prevent ski lift accidents is to make sure the clothing you are wearing is secure. Never wear loose clothing or scarves on a lift since they can easily get caught in the bars. If you have long hair, it is best to secure it in a ponytail or under a hat. Hair can get caught in the lift as well as clothing. If you are a beginner skier and are not experienced in riding a ski lift then it is best to ride with someone who is. If you are skiing alone for the first time, ask for an instructor to ride the lift with you and show you the proper technique on getting off and on and seating yourself properly. Sometimes accidents happen while on a ski lift. It is not all that common to witness a dangling skier, but it can easily occur. This happens when a skier is no longer seated in the chair but is left hanging on the lift either by their feet, arms or even by clothing. There are several things to do if you happen to be the dangling skier or are witness to this occurrence. Seeing a dangling skier is a scary sight. If ski patrol is not alerted, be sure to do so immediately. Some may find this situation funny but if you are the dangling skier you may not think so yourself. A man at Vail found himself in this situation and was the center of attention through photos and media. His mishap occurred when he got onto the lift before the seat was fully lowered. He ended up falling through the gap and was left dangling from the chair. His pants became caught in his skis and fell off completely. He did not experience serious injury but did experience humiliation. He became known as the naked skier and was the brunt of many jokes and Internet postings. Although becoming a dangling skier is a rare occurrence, it does happen. This situation can be prevented by following safety regulations for the chair lift you plan on riding on. Most resorts have posted rules to follow to ensure a safe and secure transport up or down the mountain. Keep these rules in mind to make the most of your lift experience and to avoid becoming the dangling skier.